This episode was all about family. Not “happy family”…no, this was about families that were strained to the point of breaking. When we left the last episode, Barry had stranded Nora in the future without telling anyone, even Iris. But, that’s not the only family situation in an episode titled “Snow Pack”. Things are going off the rails quickly, and whether things can be righted back is the question here. Wanna know more? Follow us after the jump! 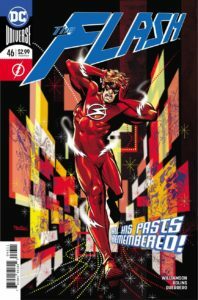 This entry was posted in Reviews and tagged Barry Allen, Cicada, Elongated Man, Eobard Thawne, Iris West, Iris West-Allen, Nora, Nora West-Allen, Ralph Dibny, Reverse Flash, Review, The Flash, XS on April 23, 2019 by Ed Garrett. This is the story of two people who wore lighting bolts…both of whom were largely forgotten for a time. One has just been reunited with his Aunt Iris. The other? Well, the other is getting his groove back on as well…and this is really HIS story. It echoes back to FLASH: REBIRTH, and gets us ready for FLASH WAR! Want to know more? Follow us after the jump! 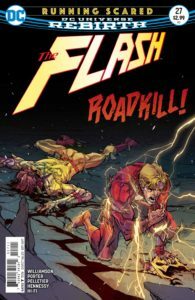 This entry was posted in Reviews and tagged Eobard Thawne, Flash War, Hunter Zolomon, Iris West, Reverse Flash, Review, The Flash, Wally West on May 9, 2018 by Ed Garrett.